Ever since I was a child, art and dogs were my reason for living. I’m not sure which one I would credit for the path my career has taken me, except to say that both dogs and art are the things that most influence my work. 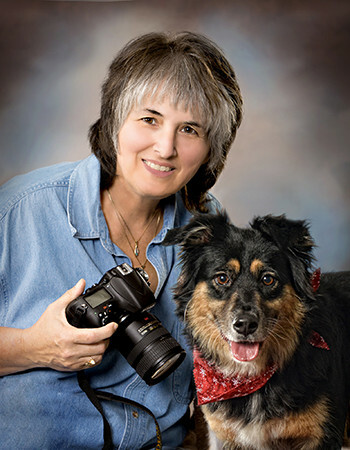 It doesn’t matter what the subject in my lens is- be it a high school senior wanting me to create portraits that capture their true spirit- or a pet owner hoping for a photograph that will keep the memory of that beloved pet alive in their hearts long after that pet has gone. I believe my special talent begins with the photography and ends with the creation of a cherished piece of art. Sounds pretty lofty, right? Anybody can press a button on one of today’s slick new cameras and get a decent picture. But it takes a special eye and creative mind to create one of a kind works of art. And that is what I strive to do with every session, human or animal. You will never be rushed or discouraged from trying anything that you feel will enhance your portrait experience. But be prepared to laugh- no long faces allowed! I am a Certified Professional Photographer and received Master Photographer status through The Professional Photographers of America. I have been awarded Silver Level Photographer of the Year in 2011 and have had prints accepted into the PPA Loan Collection. I no longer shoot weddings (which I did for over 30 years) in order to devote all my energy to portraits and the creative arts. I would love to discuss your portrait needs and have the opportunity to create your masterpiece.